Girl’s Night: It’s Time, Let’s Do This! Girls Night! It’s time, face it. We get too busy and don’t spend enough time together. And frankly, clubs got old a long time ago! This game will keep the laughter rolling and fun going! I don’t know about you, but I was never into the club scene and as I get older I am less and less inclined to want to go out to do anything like that. Anymore, getting home after 9 makes me worry about my kid and my schedule! I haven’t been on a girls only road trip since before I got married and time for them just doesn’t seem to work out anymore! We are all too busy to go running around the countryside and too tired to drive all night for anything! What I can do every now and then is a Girl’s Night! (preferably in) We get together, eat way too much chocolate and laugh until we hurt. A successful girl’s night makes everything better for at least a few months! And since we are all in one safe place, husband’s don’t worry or go all macho crazy. I’ve been given the chance to review the game “What’s a Dame to do? !”, a game which will surely give us girls a chance to get together and catch up, as well as laugh. A. Lot. The game is designed for women, definitely not the little ones. It’s not your typical family board game. This one is designed to get the girls giggling until they crack up! Just reading the cards had me laughing, imagining my shy friend blushing and my rowdy friends telling their rowdy responses! 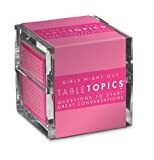 A really great thing is that you can play this with girls you’ve known forever or with girls you’ve only known for a little while! For those you don’t know that well, this is a great way to get to know them. My thoughts go to a bit of sarcasm here…. Yeah, you know I’m sharing that one! It goes around the words “Girl PLEASE, you KNOW you are already trying to predict them! Might as well do it over a game so you can get real answers to go with your assumption!” LOL. You are apparently still reading, which while I appreciate it, you should probably get on that calendar and get that phone going! 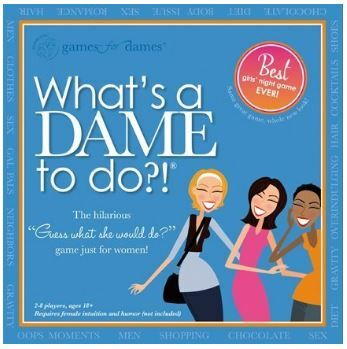 Order this game, pick up some junk food, and get your next Girl’s Night scheduled! You can find them here at just $24.99. They’ve also got great suggestions and free resources for girls night! To save you some time, check out our desserts, there are cheesecakes, cookies, and chocolate recipes to get those taste buds watering! Just so you don’t have to go through the instructions, because it’s SO boring I’ve found a youtube video to help you have the instructions and a little lowdown on the game! You can find the instructional video, along with others about the game, on their website! There are updated, easier rules there too! Enjoy!!! Sounds like fun! I have a few friends that would love to get together and play this game. Will have to check it out. Thanks for the review! 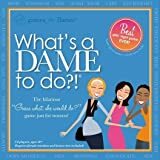 I love What’s a dame to do?! I bought on Amazon it right after I saw it featured on the Today show and being able to watch a video of how to play on the games website was a great time saver!